We have a holy water font next to our front door. I have had a holy water font since shortly after my conversion. While I was still living in the dorm in college, I had a plastic font attached to one side of my desk with command strips (little adhesive strips that come off without damaging surfaces or leaving a sticky residue). In other places it was hung near the door of my bedroom. Holy water is a reminder of baptism. In the old liturgical books, holy water was used in blessings of objects and many blessings of people. I see mentioned in many places (I have not been able to find an authoritative source -- if anyone knows where to look, please leave me a comment) that holy water has the power to remit venial sins. Whenever we leave the house we make the sign of the Cross with holy water. 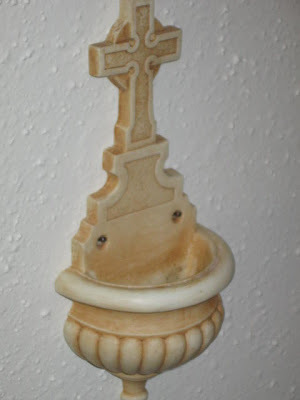 Do you have a holy water font in your home? I highly reccommend the practice. We have a tabletop font, which is really just a blue dove candleholder repurposed to be a holy water font. 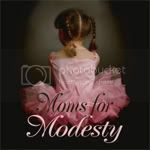 :) I would love to get a wall font, particularly for the children's room. That's a clever idea! I do recommend the convenience of a wall font next to a door. The Catholic Company has a nice selection. I don't get a commission; just sharing the results of a quick search. Check out St. Thomas on the subject. I think he says that holy water can remit venial sins, but I'm not sure. In any case, your idea is great.